I'm stuck. Somehow, while the rest of my floating crew is heading down a patch of frothy Spokane River rapids in their mustard-yellow tubes, mine has found a home perched on top of a glistening, jagged rock. Barely grabbing onto my friend's nearby tube, I'm just able to free my beached vessel and am quickly pulled screaming into the river's flowing waves, the ice-cold water splashing into my lap and my Miller High Life tallboy. Staying together is our refrain on the river. But it's easier said than done. Through rock clusters, choppy waves, beaver sightings, renditions of "Just Around the Riverbend" from Disney's Pocahontas and endless circling in eddies on the edges of the river, my posse of four attempts to stay huddled around our floating, domestic-beer-filled cooler. As we bake in the sun and pass by row upon row of evergreen trees, our undersides slowly grow numb in the water waiting for the next hurdle to arrive. 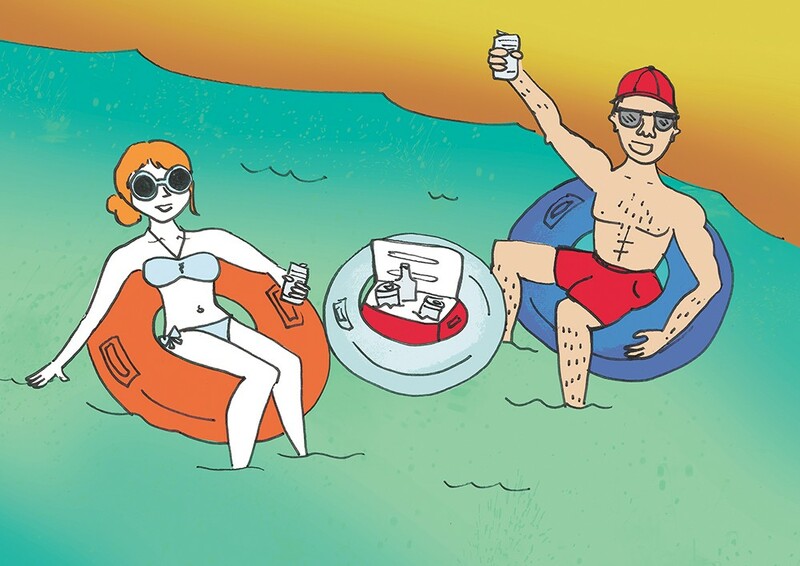 In the summer, floating a river with an adult beverage in hand is a beloved rite of passage in the Inland Northwest. This year, even with water levels at an all-time low and the air recently choked by wildfires, many of us still find refuge in a life jacket, a rubber tube and a beer. "Has anyone peed yet?" I ask my cohorts. Your entire life you've been told that relieving yourself in front of others is not acceptable, especially not in a swimming pool. But on the river, nature literally calls. Taboo be damned. Let it go. Other rules: Leave nothing behind (especially not your swimsuit; no one wants to see that). Keep empties in the cooler. Designate a driver early on. Paddle to the middle of the river, if you want to move swiftly with the current. Know the safest put-in and take-out spots before you get in. "I'm jumping out," announces my friend. We've been stuck in shallow, rocky water for 10 minutes. The sun has hidden away behind gray clouds. Goosebumps have risen. We all must stand up and pull our weight to where the water is moving. The end is near. At the close of our journey, the final exit isn't easy; the wild river isn't ready to let go. Perhaps neither are we. As soon as we go under the TJ Meenach Bridge, the exit marker, we're out into the middle of the river flowing left. The exit is river right. We look at each other in panic but also laughter, and start paddling hard. Four hours after dipping into the river, we have emerged battered, woozy and out of breath on the rocky shore. Relief sets in.